A small group of adolescent boys who are spending the summer together on an island in New England are each desperately seeking to be the first in the group to lose his virginity. Their plans and pursuits reveal the insecure antics of all young boys who are coming to grips with the awkward arrival of puberty. When this premise is presented chiefly for laughs, the result is a banal version of the teenage angst comedy film of the 1980’s. When it is done to reveal the innocence and sentimentality associated with this rite of manhood, the result is Summer of ‘42. 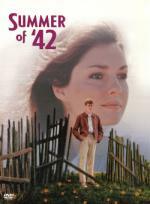 Directed by Richard Mulligan and based upon the true-life remembrances of screenwriter Herman Raucher, Summer of ‘42 showcases the exploits of Hermie, Oscy and Benjie, three young men spending a summer on Nantucket in 1942. Each is determined to experience their first sexual encounter and their summer is spent searching for the right girl to assure their success. Hermie is the most apprehensive of the three and although he is game to go along with his friends, his naiveté is what makes the film’s tone endearing and sentimental. One day he meets Dorothy, a young beautiful woman who is married and whose husband is overseas fighting for the U.S. Army Air Corp. Hermie develops an instant crush on the young woman and slowly wheedles his way into her world. Hermie does the usual things that boys do when they are smitten with their first crush; coincidentally arriving in locations at the same time Dorothy does, always being available to help out her out when she’s returning from the market. Being lonely due to the absence of her husband, Dorothy enjoys the company and the two become friends. The innocent friendship that is formed will be drastically altered when Dorothy receives a telegram from the War Department informing her of her husband’s death in battle. In a moment of weakness and after many glasses of wine, she succumbs to a need for intimacy to help ease her pain. Hermie, once again, just happens to be there at the precise moment of her desire. What follows is one of the tenderest and most romantic moments in film history as they dance together in the living room of her cottage. Dorothy slowly begins to kiss the boy and the dance slowly sways into her bedroom. Hermie’s vulnerability is offset by Dorothy’s weakness and the two share an intimate liaison that will forever change both of them. When Hermie returns the next day he finds that Dorothy is gone and that she has left the island. He will never see her again, but will live with the memory of his brief and beautiful involvement with the young woman.